A letterbox drop was delivered to every house in the approximately 500 hectare higher extreme bushfire risk parts of the Eltham Gateway area, on Wednesday March 13, 2013. 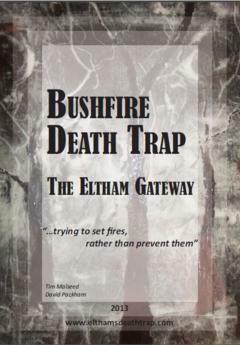 The delivery is a 28 page Paper called Bushfire Death Trap – The Eltham Gateway. The Paper has keyword links to additional documents highlighted in blue. Download the Paper in PDF or from iTunes or Barnes&Noble.